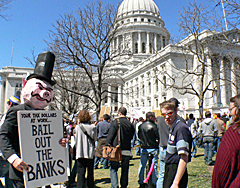 On a sun-splashed day in Madison, there was taxpayer anger in the air. Several thousand people were at the Capitol this noon for a Tax Day protest. They&apos;re equally angry over federal stimulus efforts and taxes expected to be approved by the Democrat-ccontrolled state legislature. Signs spotted in the crowd read stop stealing our money, you&apos;re not entitled to what I earn, and down with the king, and the crowd chanted "USA, USA, USA." The rally is organized by the Republican-leaning group Americans for Prosperity.